When the seasons change, this is one of the first polishes to enter my fall rotation. It’s a dark plum shade that is deep without being too dark. This is actually a recent purchase to replace my aging Revlon polish in a similar bronze shade. Unfortunately I can’t find it anymore so I decided to give this one a try. Its a bit darker and I’m loving the shade. Just looking at it makes me think of autumn evenings and the changing leaves. I remember seeing this shade in a magazine years ago and I lusted after it for years until I finally had the money to justify (ie: no longer living on a student budget) purchasing it. It’s a dark plum that comes off as a not so start alternative to black. I used to steer clear of blue nail polish until last year. Then out of nowhere all these gorgeous shades started popping up. This was one that caught my eye. It’s a sophisticated teal that I quickly fell in love with. The name pretty much sums up this shade. It’s a muted mauve that instantly makes you feel like a sophisticated lady. It also has an emotional significance because it was the shade I wore on my first date with my current boyfriend. From the moment he complimented me on how nice my nails looked I knew he was a keeper. For the last few fall seasons I’ve been searching for the pefect dark red polish. I think my search is finally over. This is a stunning oxblood shade that has stolen my heart. I’m already daydreaming about pairing it with my tan sweater and ridding boots. This is a rosey plum shade that is a perfect everyday shade. While most of my fall picks I reserve for the weekends, this is one I think isn’t too bold for the office. This is another shade that is perfect for everyday. It’s a plummy grey that I like to wear when I want to add a bit of color while still looking polished for the office. I’ve had variations of this shade in my collection for years but this is by far my favorite. 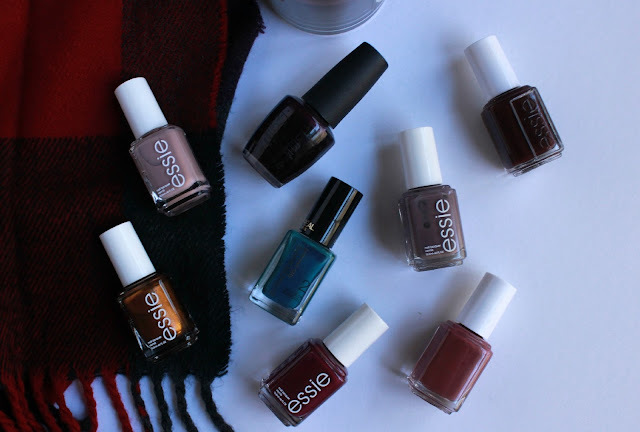 What are your favorite nail polishes for the fall? i love all of the colors you chose! great picks! Love all of these!! Especially the Merino Cool! Essie nail polishes look so good, I want to try them! I don't use nail polish often, but I think a nice matte burgundy would be great for the fall. So much Essie, I need them all! I will definitely be checking these out, thanks so much Amy!